World famous star designer Jasper Morrison designed the Pipe collection for the Italian manufacturer Magis in 2008. 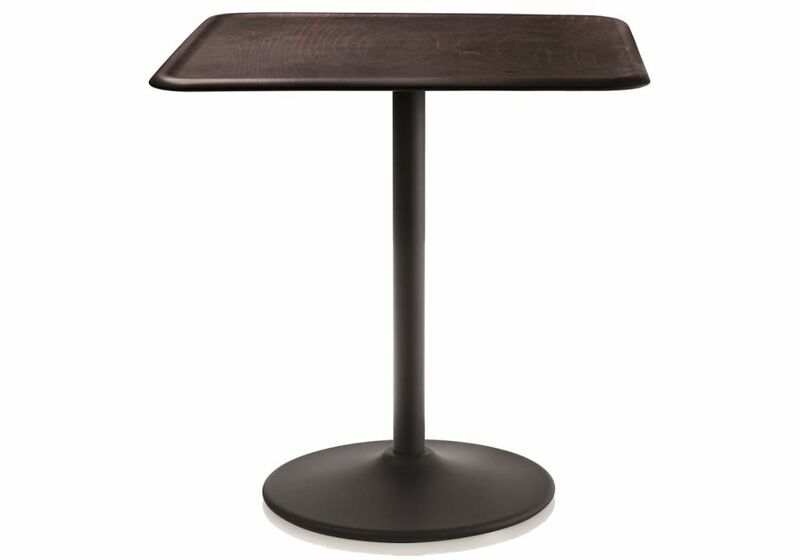 Its simple design is especially suited for the contract market and comprises chairs, stools, and tables. This square Pipe table is made up of a base made of sheet steel, a frame made of rust protected, polyester lacquered steel, and of a table top made of beech ply wood. Thanks to its materials the Pipe table is suited for outdoor use.On request the Pipe table is available in other colours and as round version. Jasper Morrison was born in London in 1959, and graduated in Design at Kingston Polytechnic Design School, London (1979-82 BA (Des.)) and The Royal College of Art for Postgraduate studies (1982-85 MA (Des.) RCA). In 1984 he studied at Berlin’s HdK on a Scholarship. In 1986 he set up an Office for Design in London. Today Jasper Morrison Ltd. consists of three design offices, a main office in London and two branch offices: one in Paris (opened 2002) and one in Tokyo (opened 2007). Services offered by Jasper Morrison Ltd. are wide ranging, from furniture to tableware and kitchen products, to lighting, electronics and appliance design, designs for public space and more recently watches, clocks & shoes. In 2005, he founded Super Normal with Naoto Fukasawa. June 2006 saw the first Super Normal exhibition in Tokyo. In 2009, the Jasper Morrison Limited Shop opened in London, and in 2011 his webshop was launched. He has clients across the globe, all leaders in their individual fields. They include: Magis, Alessi, Camper, Cappellini, Flos, Rado Watch, Rosenthal, Rowenta, Samsung Electronics, Sony Design, Vitra, etc. Established in 1976, Magis combines design, technological innovation and a 100% Made in Italy ethos to create high quality products.